Winmate Inc. announces a second-generation update to the M101 Series with its high-performance M101S. 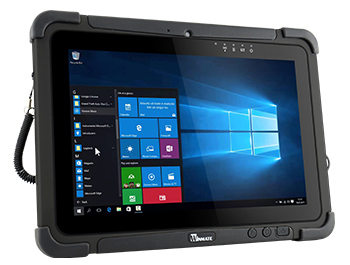 This newly updated Windows 10.1-inch Rugged Tablet PC is equipped with a 7th generation Intel Core i5 Kaby Lake processor and will sit at the top of Winmate’s M101 product family for those that need substantial processing. The top of the line computing performance will satisfy the needs of any users that require heavy usage in on the move industries such as warehouse management, transportation and logistics, retail services and Oil & Gas industries. The M101S is a substantial update to Winmate’s existing top of the line M101H. The improvements aren’t just limited to the change from a 5th to 7th generation Intel Core i5 processor - the M101S is a total package update. The brightness of the display has increased 100 nits and the wireless connectivity features have been upgraded with 802.11 a/b/g/n/ac WLAN as well as Bluetooth 4.2, with global navigation systems now featuring GPS, GLONASS and BeiDou. 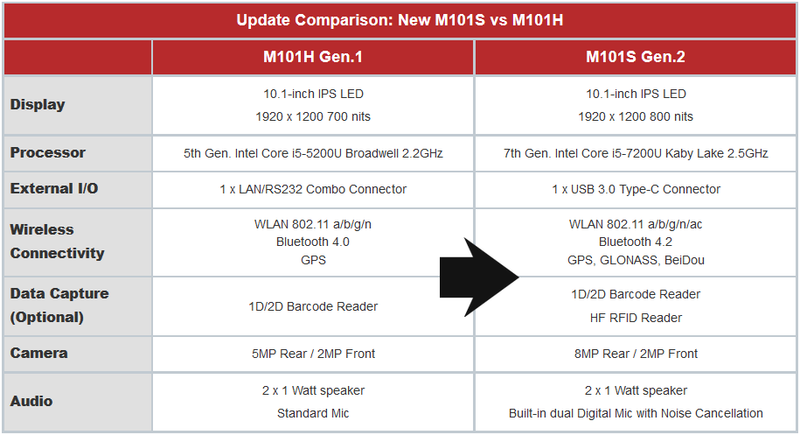 In addition, the M101S improves its input ports by now including a USB 3.0 Type-C Connector, replacing the LAN/RS232 connector on the M101H. The Type-C connector shrinks the standard USB Type-A port to a third of its size and is reversible, increasing its ease of use. This connector type can also function as a LAN or RS232 port as well as outputting VGA with an adapter, allowing versatile connectivity in a streamlined port. Camera and audio has also been updated, with the M101S now featuring an 8MP rear camera and dual mics with noise cancellation. As with all of Winmate’s Rugged M101 Series, the M101S is IP65 certified water and dust proof and features Military Standard MIL-STD-810G compliance for shock, vibration and drops from 4 feet to ensure reliability on the job and in the field. Winmate’s M101 Series was first established in 2013 with the introduction of the M101B. The product family has expanded such that Winmate now offers a variety of tablet options that will satisfy all users: from Windows to Android to Ubuntu operating systems, to offering ARM Cortex to lightweight Intel Pentium to high performing Core i5 processors. A plethora of other customizable options including wireless connectivity and data capture such as Barcode, RFID, NFC, and Smart Card Readers allow users to configure the tablet PC to best suit their industrial application. The newly released M101S is just the latest addition to the M101 product family; its high performance will meet the needs of users that require demanding performance as well as reliability in a rugged package.